Morning! Today I have a very glittery, shimmery card to share. I've been dipping into a few different mediums lately, and glitter has been at the top of my list! I was on the lookout for an ultra versatile sparkle that could work with a lot of different colors, and after heaps of searching, I found one I absolutely love. 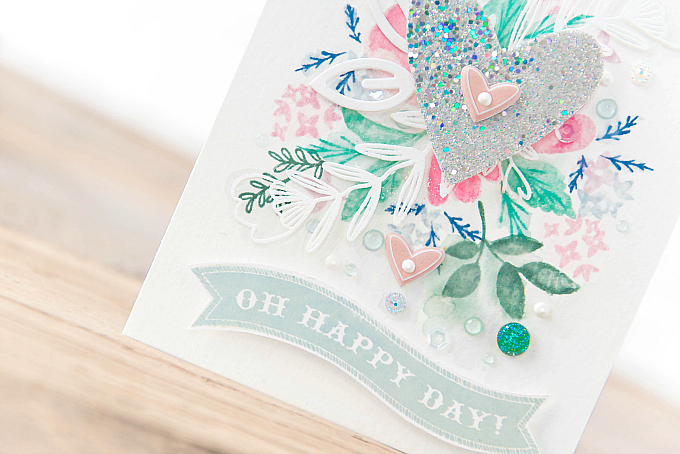 Today's card features sparkly bits with this new fave as well as favorite stamps from Wplus9 and Pinkfresh. To start this card, I used Wplus9's Southern Summer Florals 1. 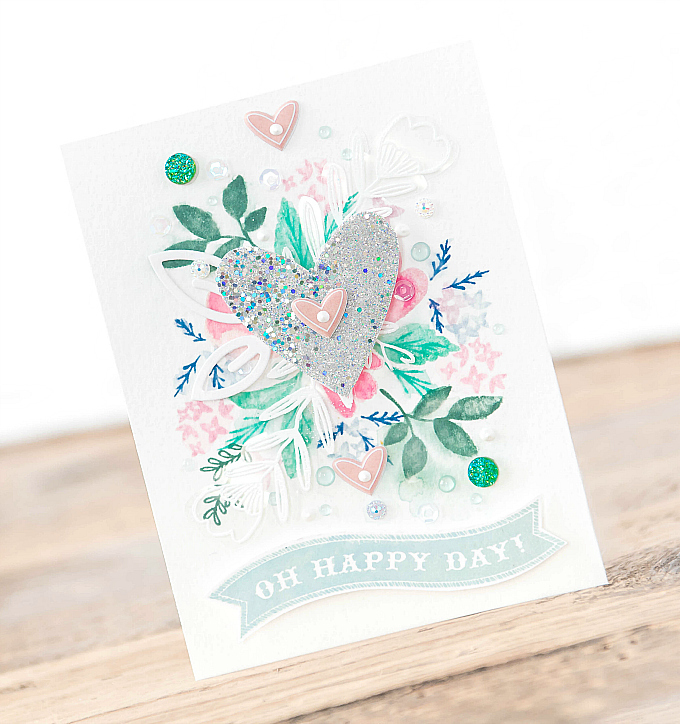 I've seen piles and piles of gorgeous cards created with this lovely set - check out a few here. But I wanted to try something a little different, so I stamped a floral cluster onto my cardstock base, with PTI's water-based inks, using colors of Pinefeather, Hawaiian Shores, Tropical Teal, Hibiscus Burst, Raspberry Fizz, Lovely Lady, Blueberry Sky and Enchanted Evening. 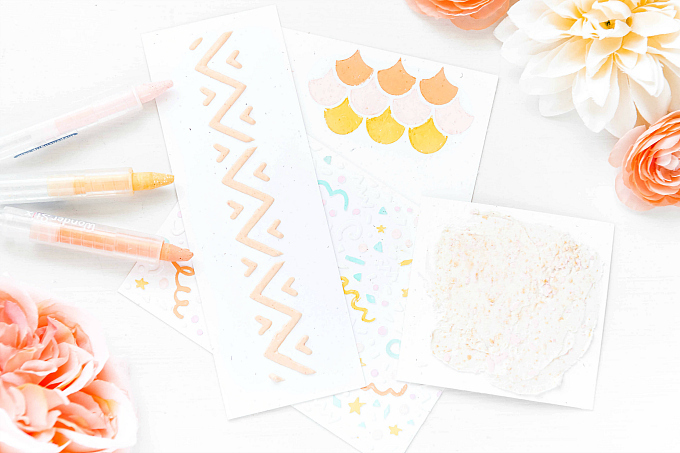 And stamping all the bits, I used a water brush to gently go over all the designs, to give them a muted, water-streaked look. Sort of loving this style! Once the base was dry, I added a pile of rhinestones, sequins, and some Nuvo Jewel drops in Sea Breeze. I also added some white detailing, using the Fleur 1 stamp set from Pinkfresh (featured on Monday Favorites here), stamped and embossed on acetate. I added a few puffy stickers, and some iridescent glittery jewels. For the heart, I used double sided adhesive sheets adhered to cardstock, before running it through my Big Shot with PTI's Limitless Layers: Stitched Hearts. 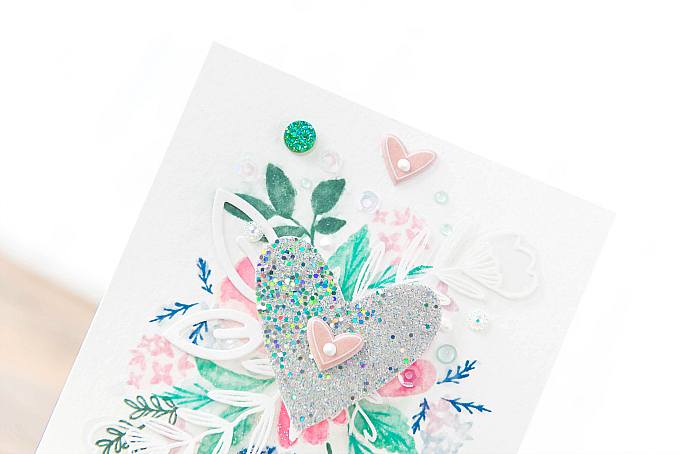 I generously sprinkled my new, favoritest Stampendous Silver Halo glitter all over the heart, paying special attention to add a bit more of the chunky glitter to the one side, and fine glitter to the other, for a cascading look. I love, love, love this gorgeous glitter! Lately, I've been a big fan of iridescent things, and this glitter totally checks that box! It's so very beautiful, and the two different sizes that come in jar make for oodles of options and a really interesting look. I'm itching to pick up the Gold Halo mix too! To finish off this card, I stamped a little banner and fussy cut it before I added it to the card with some 3d adhesive. I love the look of these elements together and how modern and fresh it makes this card look! 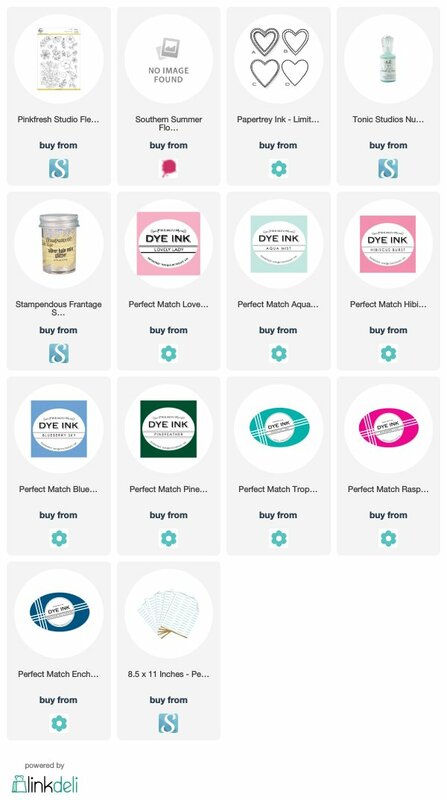 Do you have a favorite glitter - one that you adore? Show us how you love to use it! As always, biggest of thanks for joining me today, friends, and for all of your kindness. Modern, fresh & GORGEOUS! Your style is wonderful & this card may be my favorite, Ivana! Love the softness & the colors you chose! 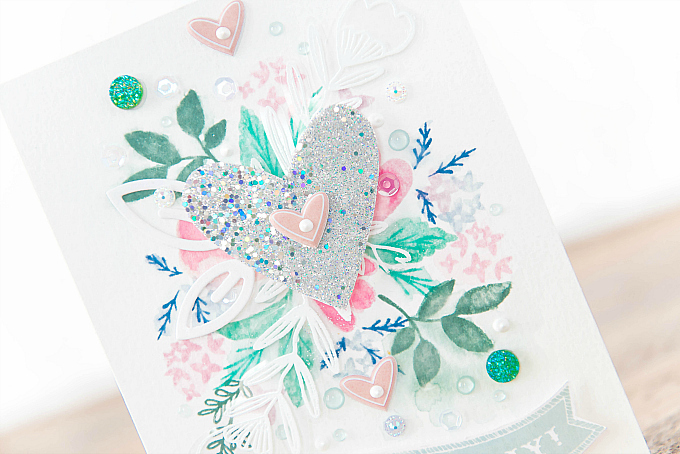 Ivana, such beautiful color, detail, dimension and sparkle.... all in one amazing card!! Wondering where I might find the lovely 'Oh Happy Day' banner? Many thanks! I like how wispy your design is! The sparkle is wonderful. This is pretty Ivana! Aw, you're too sweet, my friend! Biggest of thanks and many hugs!